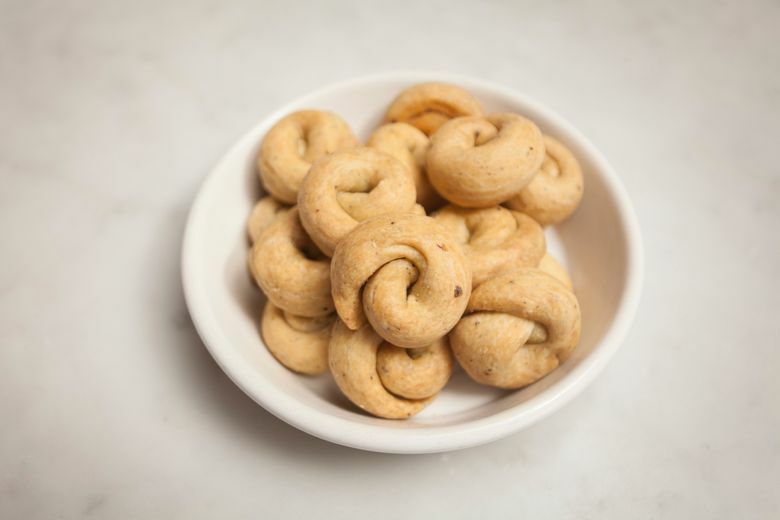 The Italian bar snacks are crisp, melting rounds of dough made with just flour, water, olive oil for taste and richness and a little wine for crunchiness. 1. In the bowl of a standing mixer, whisk together dry ingredients. Add oil and half the wine. Use the paddle attachment to mix on medium-low speed for 12 minutes, adding remaining wine occasionally. Dough will be springy and moist but not sticky. If it is sticky, refrigerate 30 minutes and mix again. Add more flour a little bit at a time if needed. 2. Heat oven to 375 degrees, or 350 degrees with convection. 4. Bake 15 to 20 minutes, rotating pans halfway through baking, until golden brown. (Add three to five minutes if baking from frozen.) Cool before serving. Will keep up to a week in a sealed container.